Growing up in 1980s Ireland, breakfast generally involved cereal from a cardboard box, sometimes with the added bonus of some kind of toy hidden inside. Sometimes with a side of toasted slice pan, or perhaps, a boiled egg. And always with a cup of tea. In reality my routine has changed little in the last three decades. Breakfast comes in a bowl midweek, porridge hot or cold, depending on the season. At weekends, when there’s more time for food preparation and lolling over a meal, eggs are usually on the menu. But in an era of food as a fetish, even the humble breakfast isn’t safe. Porridge with milk and maybe some apple or raisins to liven it up a bit simply doesn’t cut it these days. No, breakfast now comes with unpronounceable ingredients like acai. And, by decree of Instagram, must be green. I’m as guilty of jumping on a bandwagon as the next person, and I do like trying out new ingredients or recipes. But when it comes to breakfast, I’m very much a creature of habit. Which is why, I’m not convinced on the merits of a smoothie for breakfast. And definitely not if it comes in a bowl. Why would you want to eat a drink with a spoon? But, I capitulated last week due to unseasonably hot weather and the allure of something resembling an ice-pop for breakfast. My first attempt at a smoothie bowl was a blend of frozen berries, milk and oats. Next I added some nuts, more frozen berries and coconut. It was very refreshing, but not very filling. Another sticky hot morning encouraged me to have another go, this time with raspberries, oats, cashews and lime zest. I’ll agree with Instagram on one thing. Smoothie bowls look lovely once tarted up with nuts and so on. A very pretty breakfast. But my ideal breakfast is less pretty, more filling. I remain devoted to porridge. There’s something very comforting and nostalgic about a dippy egg, soft yolk spewing as a buttered soldier dives in. A perfectly fried egg, crispy and runny at once, served with chips and ketchup is another favourite memory of mine, one I associate with ‘quick dinners’ and canteen lunches. I’ve tried some lovely vegan dishes recently in a bid to boost my intake of veggies. But I could never become a vegan. Firstly I lack the inclination, and secondly, I’d miss eggs too much. Meat and dairy too, but especially eggs. The best part about eggs? Versatility. They work for breakfast, lunch or dinner. Boiled, scrambled, baked, fried, poached…all equally as tasty. I’m partial to a quick omelette for a lazy dinner, and also love eggs for breakfast, especially at the weekend. In the last few months, I’ve been doing a fair bit of running, and work has been busy, so eating decent food has been important for keeping the show on the road. One Saturday, attempting a long-ish run after a 14 hour work day the day before, powered by multiple cups of tea and far too many biscuits, I felt awful. Sluggish, heavy-legged and not in the humour to run anywhere but to my couch (for more tea and biscuits). Usually I eat reasonably well, but am certainly prone to eating too much junk. And generally, the busier I am, the more junk I eat. Which, when you think about it, is really rather stupid. So in recent weeks, I’ve been trying to think more logically about food as fuel. Dodgy petrol won’t do much for a car, so why would bad food be of any use to a human? Running has made me much more aware of this, which is silly as it is not exactly rocket science. Even something simple like getting enough water in the day before a run can make such a difference. It’s not a question of being virtuous, but more ensuring you eat whatever you need to get you through the day you are facing. So now, if I’m asking a lot of my body, it seems reasonable that I give it the right food in return. Happy fuelling! For me, brunch usually translates as one of two things: eggs or pancakes smothered in butter and maple syrup. Much as I love the latter, I’m trying to opt for eggs more. Still delicious, but hopefully a bit better for me! Peanut butter and I took a while to get off on the right foot. A few years ago we tried to get acquainted but I simply couldn’t warm to it. Too gloopy, too heavy and not my thing. Or so I thought! Times change, and so does your palate it seems, because recently I’m guzzling peanut butter and have made my way through jar after jar of it. I love the super-healthy version from the health food shop with no nasty additives, but it’s a lot more expensive than a reasonably healthy version from my regular supermarket. which adds some sugar and salt but not too much. So, most of the time reasonably healthy suffices. Beyond simply slathering peanut butter on toast, here are five really tasty ways to use it. 1. The smoothie: This smoothie recipe from Deliciously Ella actually suggests almond butter but I had a try with peanut butter and it was very tasty and rather more-ish. 2. The cookie: Oats, apple and peanut butter in a cookie. What’s not to love? Gooey, sweet and tasty…it’s very easy to over-indulge! 3. The breakfast: If you like breakfast that doubles as dessert, then this overnight oats recipe with peanut butter and banana is worth a try. Be warned though, a little goes a long way as it is very heavy. But also incredibly tasty! 4. The snack: Apple rings with a little peanut butter spread on top. SImple, quick and tasty. 5. The main meal: Satay chicken is a personal favourite of mine, and something I’d order a lot if I’m treating myself to a meal out or a takeaway. But creating a version yourself with peanut butter and a few other cupboard staples is pretty easy too, as this straightforward BBC recipe shows. 6. The treat with a twist: I love brownies, and probably eat them far too frequently. This semi healthy option uses oats and yogurt instead of flour and butter. And it also has a peanut butter twist. There will always be days when getting out of the house in the morning is an uphill battle. 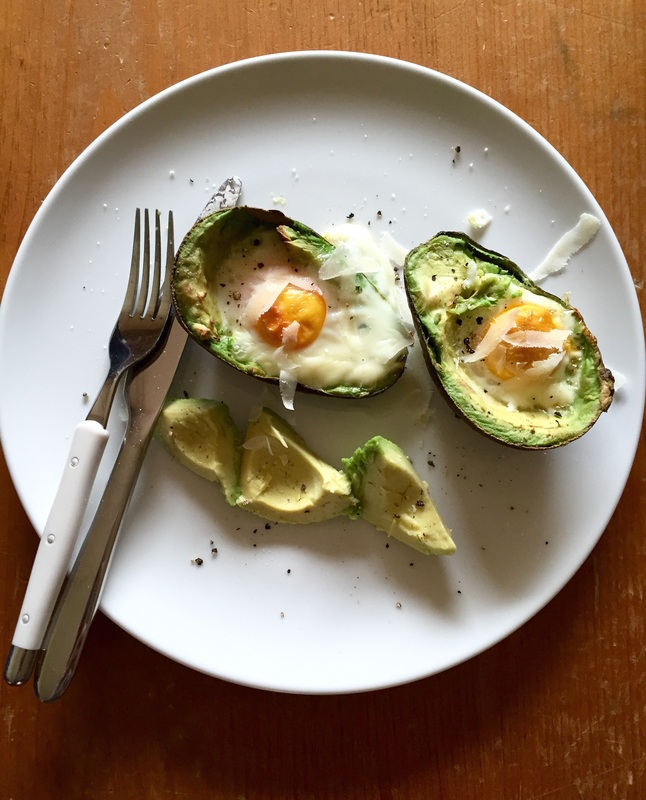 If you know that you’ve an early start ahead, or an especially busy morning to contend with, minimise the hassle for yourself by preparing breakfast in advance. 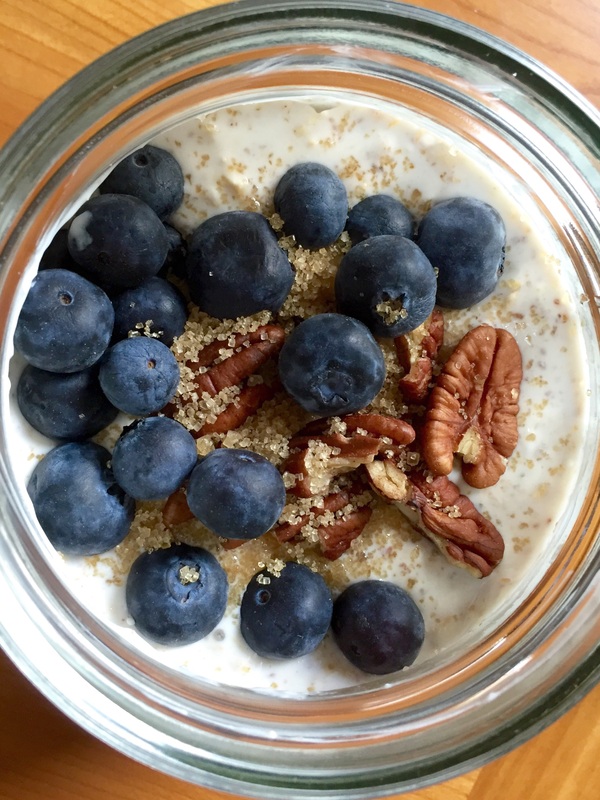 I’ve posted before about overnight oats, a very handy breakfast option. I’ve been eating a lot of variations of overnights oats recently, with this blueberry pecan one my current favourite. It takes just a couple of minutes before bed to prepare. Pop oats, yogurt, milk or water and assorted toppings in a sealed container overnight. Then in the morning, give it a stir and dig in. I especially like this blueberry pecan version from the lovely Pinch of Yum, because it adds flax to the oats which gives a lovely texture. I used plain yoghurt, not vanilla, but I still found it very tasty. For me, having pancakes for breakfast means it is most definitely the weekend. It requires a little bit — but not a lot — more effort than the bowl of porridge or smoothie I typically grab to start the day during the week. Pancakes equate to the luxury of time to me. Time to prepare breakfast, listen to some music, sit down at the table to eat and time to not rush. 1) Anything with two ingredients sounds like my kind of lazy weekend. These banana and egg pancakes are very tasty. I sometimes add a spoonful of buckwheat flour to add some texture. 2) This lovely recipe from The Little Green Spoon is also up there on my favourite pancake list. Both recipes make quite a filling breakfast. You can add whatever you want – berries, nuts, sugar, cream. For me there is no better breakfast than porridge. It’s cheap as chips, tasty, fills you up and is pretty healthy too. Plus it’s quick to make when you are legging it out the door in the morning. That said, if you eat the same breakfast day in, day out, it gets a tad dull. My default options are porridge with raisins, grated apple or coconut flakes. All tasty, but a bit boring after a while. So in a bid to escape my breakfast rut, here are two tasty alternatives. 1) I came across this exotic porridge recipe in The Medicinal Chef, a cookery book I won in a raffle recently. With coconut milk, cardamom, pistachio and rose, it sounds like a lot of effort but is actually quick enough to do pre-work. And you feel awfully decadent having this of a Wednesday morning! 2) During the summer I usually switch my porridge for granola with fruit and yogurt. But it just doesn’t fill me up. 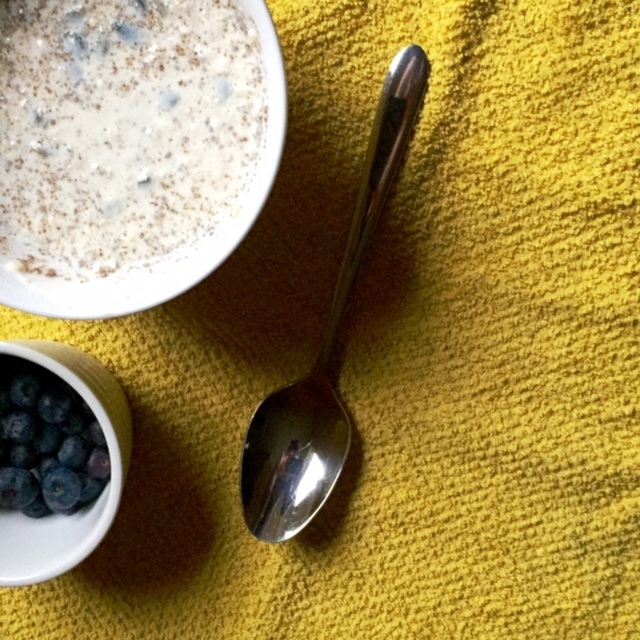 Derval O’Rourke’s book, Food for the Fast Lane, introduced me to the concept of overnight oats – a cold alternative to porridge for the summer. You just put oats, yogurt, milk and various flavourings in a bowl overnight, let the oats soak up the moisture and eat it up the next morning. I have since tried multiple versions of this, with apple, coconut, blueberries, nuts, seeds and all sorts – a clear out your kitchen presses sort of breakfast. And it’s nice all year round, not just in summer! A lazy breakfast is a great start to the weekend. For me, a big mug of tea and ‘fresh from the oven’ brown bread slathered with something gooey, such as jam, mashed banana or peanut butter is a lovely Saturday morning treat. Soda bread is quick to prepare, and then takes about 45 minutes in the oven…but it is worth the wait! I’ve tried a variety of bread recipes over the last couple of years. Currently I’m using a modified version of this vegan one. 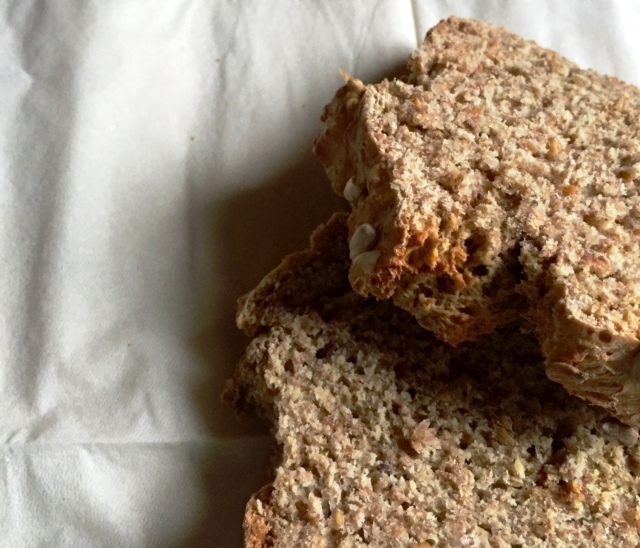 I came across this recipe when hunting for a dairy-free brown bread recipe (to make dairy free bread for a visiting friend). I’ve since modified it, adding back the dairy (normal milk instead of soy/almond milk), using 1 egg and leaving out the sugar. I’m pretty happy with the results, and it also means I don’t end up with half a carton of buttermilk lingering in my fridge. Play around with it, add seeds or oats, and find a texture that you like.